Every menopausal woman agrees that all you want is quick relief for hot flashes when you're suffering from those overwhelming sensations of heat. While cooling down quickly may not always be easy, there are some things you can do to alleviate the feelings of overheating. Read on to discover how to get relief from hot flashes following these four easy tips. Hot flashes often occur in the most inconvenient places: at work, at a restaurant, in the supermarket, etc. Fortunately, even though you may not always have control over environmental factors, such as air conditioning, there are still actions you can take to cool off. If you're having a hot flash, a cool oasis is a must. Always keep an eye out for the nearest public washrooms, such as in air conditioned stores. There you can find relief by splashing cool water on your face and neck or removing a layer of clothing in private if you're sweating excessively. Removing a layer of clothing can provide quick relief from hot flashes. Wear layers that can be easily removed in case an episode occurs. However, be wary of 100% cotton when choosing your wardrobe. Although renowned for its breathability, cotton actually traps moisture, which can leave you sweaty long after your hot flash is over. For an optimal wardrobe, read though more suggestions on how to dress for hot flashes. Generally, you don't want to weigh yourself down with accessories in case of a hot flash, but one must-have accessory is a hand-held fan. These are small enough to fit inside your purse and are handy for fast hot flash relief in places without air conditioning. It may sound like a no-brainer, but you've probably been caught without a water bottle during a hot flash. Always keep a chilled water bottle on hand with a few ice cubes slipped inside for longer lasting coolness. Keeping yourself hydrated goes a long way in cooling down after a hot flash. Keep in mind that hot flashes are caused by hormonal imbalances, but can be triggered by several environmental and psychological factors, including stress and anxiety. Without a doubt, lifestyle changes may help alleviate hot flashes. These include avoiding caffeine; hot drinks; spicy or hot foods; and alcohol. Also, increasing your level of activity - for example, taking the stairs instead of the elevator - can reduce hot flashes by supporting endocrine system health. However, boil down to the bottom of the issue and investigate more ways in which you can treat hot flashes to bring lasting, not just quick, hot flash relief into your life. 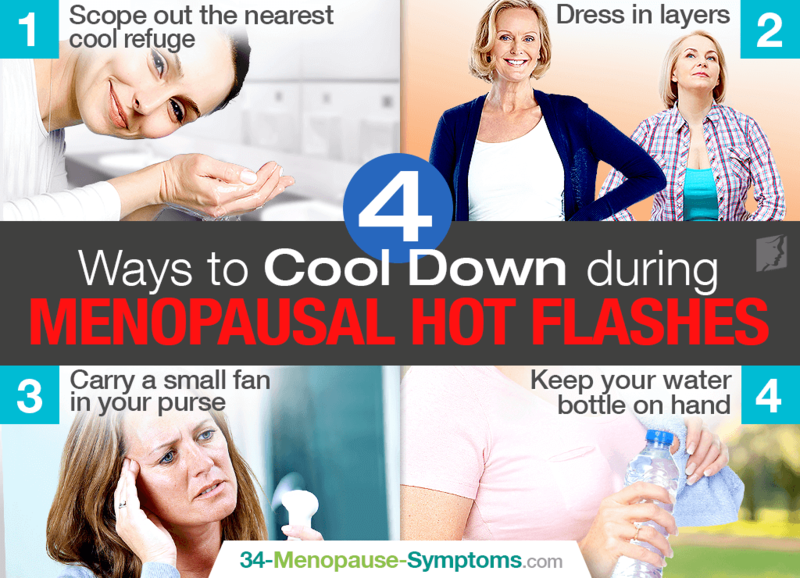 How Can Black Cohosh Help Hot Flashes? Hot flashes can strike unexpectedly and cause stress, nervousness, and anxiety. Keep reading to find out more about hot flashes in young women.